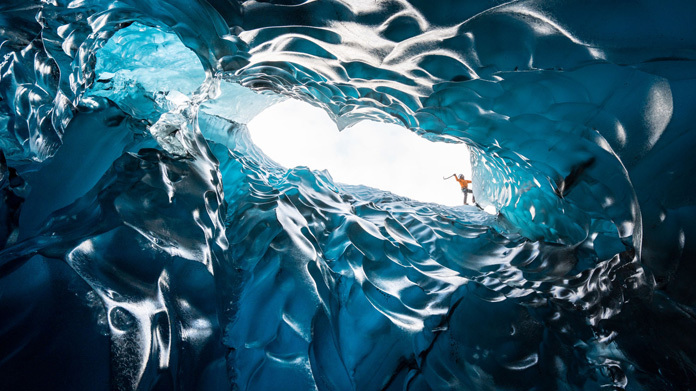 There aren’t very many photographs of the ice caves of Iceland’s Vatnajokull Glacier. That was exactly why we decided to send one of our favourite photographers – Mike Buck – to capture them in all their beauty to show off the stunning Sony α7R II camera. Mike went with top local guides, Einar Runar Sigurdsson and Helen Maria and got the opportunity to explore the country’s frozen landscape and used Sony’s latest digital cameras – including one with the world’s first back-illuminated full-frame sensor which brings together ultra-high resolution and ultra-high sensitivity. We got our shots back about a week ago, had a quick hack through and knew we were sitting on a goldmine. And so it was to prove when we put the stories out in anticipation of some pretty formidable pieces of coverage – hence we set about selling them in and making sure that the brand messages made the cut too. We were richly rewarded with coverage across the Daily Mirror, The Guardian (in print as well), the Independent, Daily Mirror, Daily Telegraph, SKY News, Aol. and Pocket Lint, amongst many others. What’s more, we also scored an absolute stunner with the nice people at Buzzfeed, who put together an awesome piece for us. Altogether, a stunning little piece of work. Even if we do say so ourselves.